Time management during centers is so important for our little learners. No matter what system you use, it’s important for students to know the expectations for the classroom centers. Our center time is an hour each day which is a huge block of time for students to play and learn! In my classroom, I have five centers: library, blocks, pretend, art, and discovery (math and science together). You can read more about each center by clicking on the word. Each center has a symbol and a color. The blocks center is yellow and the symbol is a stack of blocks. Each center can have three students at a time, which is why there are three clips on each center. Once the clips are gone, that center is full and the student needs to pick another center to go to. The shelves in each center are labeled with the center sign to help define each center. The center sign is backed with colored cardstock. Students wear the colored clothespins on their shirts/dress. It is also a visual reminder for the students, their peers, as well as, the teacher. At the beginning of the year, I read books and teach students about our classroom centers. These are my favorite books to teach about our classroom centers. I read one book each day about a different center. 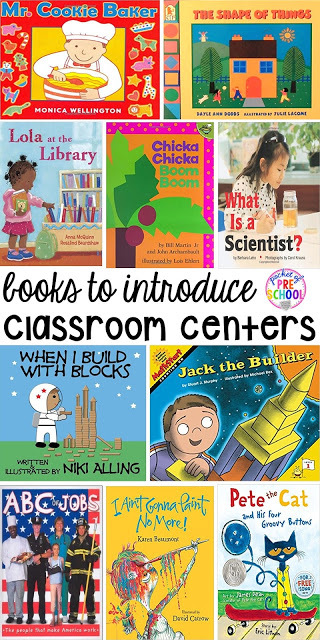 Depending on how fast the students learn the names of the centers, I either read multiple books about each center or just read one book about each center. Instead of open centers the first few weeks, I spend time during center time to introduce each center in detail. I do this with the whole class (my new class only has 10 kids) and we sit on the floor or at the table in the center. I introduce the center name, color, and symbol. We talk about the materials in the center, how to use them, who we could pretend to be, and how to clean up. Then the students play in that center for about 20 minutes or so. After that, we go to another center and do the same time. Once I have introduced each center once, the second time we go to the center as a class we review it. It takes about 5 minutes and then students play in that center for 25 minutes or so. Next we go to another center, review it, and play in that center. When I taught full day (18 kids a day) I split the class in half. Each group went into a different center with a teacher, and after 30 minutes, the kids switched and went to the other center for 30 minutes. 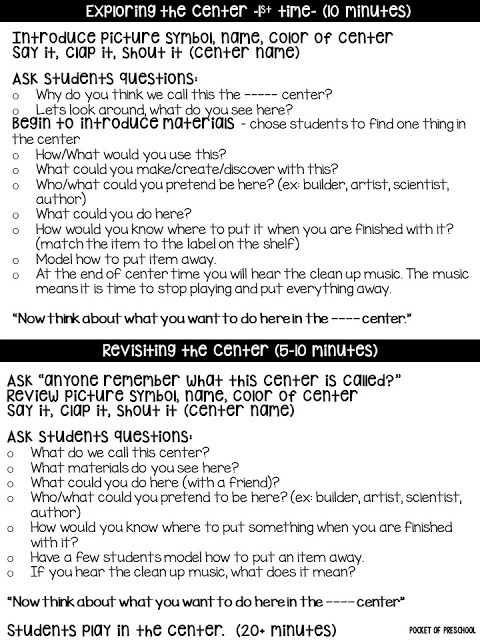 You can grab my FREE “Exploring the Center” printable HERE with exactly what I say and do. Just print it and put it in your lesson plans. Take the time to do this at the beginning of the year! It is NOT a waste of time. If you want students to pick a center and/or be able to stay in a center, they need to be taught about the centers. It takes me about 10 days to do this (two centers a day, introducing each center then reviewing it the second time around). Once students have learned about each center the fun begins! Each week I add at least one new activity, game, or manipulative to each center. It sounds like a lot but I only have 5 centers so that’s only 5 new things a week. When it’s center time I place the center chart on the floor to show students what’s new in each center, and tell the students to talk about it with each other. My hope is that they find a friend to play with during centers. Students always have the option to play alone as well. In my class, STUDENTS PICK THEIR CENTERS. If I notice a student is going to the same center over and over I put something I know they will love in another center to get them to go somewhere else. I don’t write down what centers students pick. Some teachers do but I don’t. What happens when all the clips for one center are gone? The students have to pick another center to go to. Yes, some do get upset. I think it’s an important skill to learn that sometimes you don’t get what you want and making a second choice is ok. I don’t have dots on my center charts or posters because sometimes I add or take away the number of clips per center depending on which activities are out. 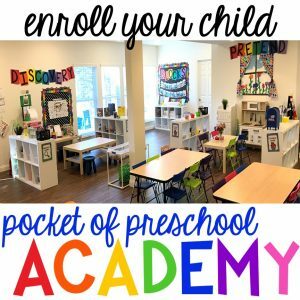 Students can change centers as much or as little as they want. Younger students will change centers more because their attention span is smaller. I usually ask the student if they want to make another choice in that center but they don’t have to. My goal is for students to play in the same center for the whole center time by the end of the year. Now that doesn’t mean they play the same game or activity. 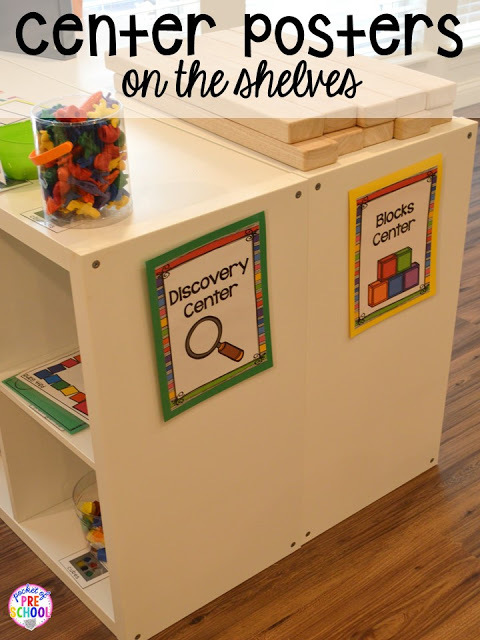 They may explore rocks, play in the sensory table, and play a math game in the discovery center. 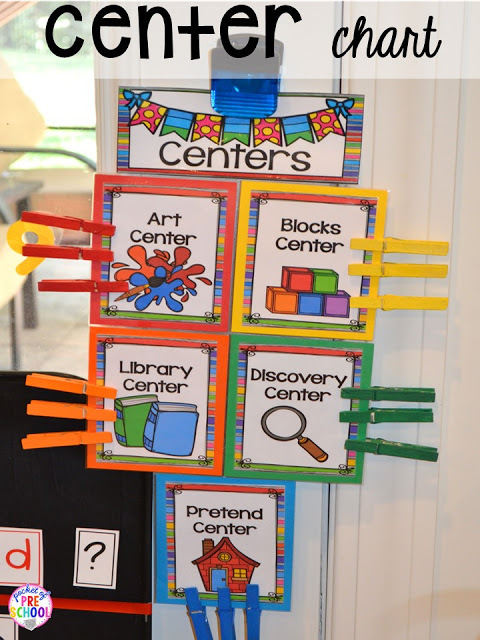 Grab my Rainbow Center Signs from my TPT store HERE so you can make your own center charts! If you want a cleaner design (clip art with a simple black border), grab my Simple Design Center Signs HERE. 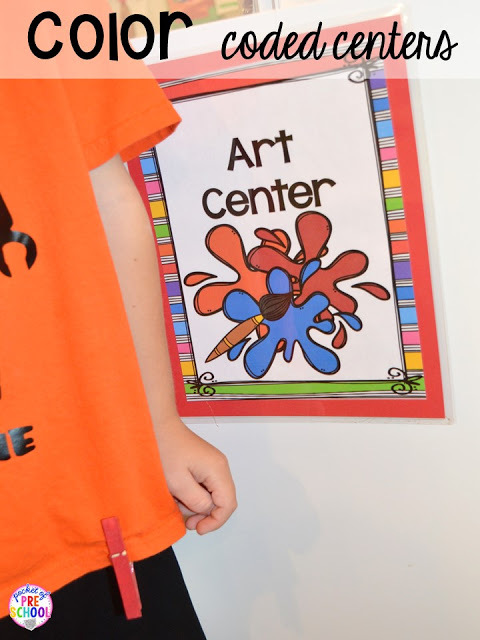 The center posters are perfect for Preschool, Pre-k, and Kindergarten. To make the center board with all the center signs, I printed them smaller. CLICK HERE to watch a quick video on how to print things smaller. Everyone always asks where I find the colored clothespins and I make them! The clothespins break on occasion so I buy cheap wooden clothespins from the laundry section at Target or Walmart. Then I just spray paint them with spray paint. Any kind of spray paint will work. Just make sure you wear gloves so you don’t paint your fingers too.